My husband was telling me about an Apricot Chicken dish he remembered having a child. All he could really remember was it had apricot jelly. I decided it probably had apricot preserves. The internet is such a great thing, hard to remember life without it. I did some searching and the recipe that kept coming up was one with just three ingredients, apricot preserves, onion soup and russian dressing. How simple is that? I decided to make it even easier and use my slow cooker. I work full time and the slow cooker is my friend! There's nothing better than coming home and having dinner ready. Combine and pour over chicken. Cook in the slow cooker 8 hours. 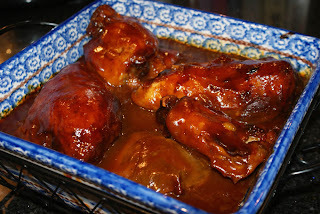 Remove the chicken from the the slow cooker, strain the sauce and use a fat separator to drain the grease. Whisk together 2 tablespoons of cornstarch and 3 tablespoons of water. In a saucepan, combine sauce and cornstarch mixture. Cook over medium heat for 10 minutes or until thickened. Place chicken in serving dish, cover with sauce. Serve over rice. My notes on this recipe: I thought this was good but a little bland. I want to experiment with the ratio of dressing to preserves. I think the addition of some herbs or spices would help as well. I'm all over anything apricot. YUM.